Do your business processes seem tired and out of date? Have you ever said to yourself “there has to be a better way”? Don’t worry, you’re not alone. This is the starting point of most of our clients. They are tired of conducting business in a specific way simply because ‘it’s always been done that way’. Let us show you the different ways document management and office automation can help you revolutionize your business processes for a more enjoyable and productive work environment. Are you always looking for a way to get an edge on your competitors or deliver an outstanding customer experience? If so, you’ll love the way that improved information management and office automation can help streamline your business processes; reducing costs and skyrocketing customer satisfaction! Putting the information you need at your fingertips and automating manual paper tasks is only the beginning, find out how technology can give you and your team a unique competitive advantage. Is your office over-run by boxes and filing cabinets, leaving your staff to work in cramped conditions? Is the optics of piles of paper around your office impacting your clients’ perception and confidence in you? Are you moving and you don’t want to take all those paper records with you? Don’t worry we can help. Our document scanning services can help alleviate your office of all those paper files and our paperless office solutions will ensure they never come back again! PIPEDA, FIPPA, CPIN, PHIPA, MFIPPA and about a dozen other acronyms impact they way you do business and manage records. Mandates that come down from external entities often leave organizations struggling to minimize costs while mitigating risk. If you’re faced with the challenge of complying with a federal, provincial or industrial regulation we can help. The implications of poor document management can be devastating for some organizations such as: healthcare, social work, child protective services, legal, financial, human resources and many others. The loss of information can lead to legal, financial and social implications. That’s why security, structure and accuracy are at the heart of our scanning and management solutions. Maybe you have content trapped in a legacy system? Or you’re holding your breath, hoping, your old DOS application magically keeps going? Have you outgrown your existing DMS? Are you looking to consolidate different information silos around your organization? Well, you’ve come to the right place. Since 1971, we have been helping our clients better manage their information and we can help you too. 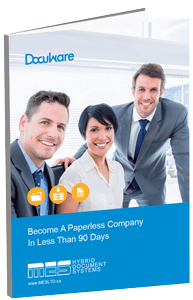 Improve the speed and accuracy of your business with document management and office automation software. Whether it’s a few boxes everyday, or thousands of boxes at once, our document scanning services will transform your paper files into useful digital information. Are you tired of the never ending invoice that comes with offsite document storage? Or how about the time it takes to get the information you need? Then Scan to Zero is the answer for you.